The agreement to set up this corridor was signed in 2000. Transportation of goods along the North South International Transport Corridor is likely to begin soon, bringing down costs and encouraging growth prospects for trade. Moscow hosted an international conference on the North-South International Transport Corridor on December 8, organized by the Indian Embassy in Russia, along with the Russian Ministry of Transport and the embassies of Azerbaijan and Iran. This was perhaps the first time that the North-South ITC was discussed in a quadripartite format. It is time to not only discuss the pressing problems, but also to move on to the practical implementation of the huge project, aimed not only at connecting these four countries, but also at making it a key infrastructural integration factor in the vast expanse of Eurasia. The project itself was conceived at the turn of the millennium, when Russia, India and Iran proposed a revival of the ancient transport route. The main ITC route begins in the ports on the west coast of India (particularly Mumbai), passes along the sea to the Iranian ports of Chabahar and Bandar Abbas, and from there by land to Iran’s Caspian Sea coast and beyond – or across the Caspian Sea to Astrakhan, or overland to Central Asia or the Caucasus to Russia and northern Europe. The agreement establishing the North-South ITC was signed in September 2000, and entered into force on May16, 2002, following ratification by all three countries. In later years, 11 other countries joined the project: Armenia, Azerbaijan, Belarus, Bulgaria (observer status), Kazakhstan, Kyrgyzstan, Oman, Syria, Tajikistan, Turkey and Ukraine. Cmpared with the current means of transporting goods from South Asia to Europe, the ITC offers several advantages, the main one being that it is much faster. 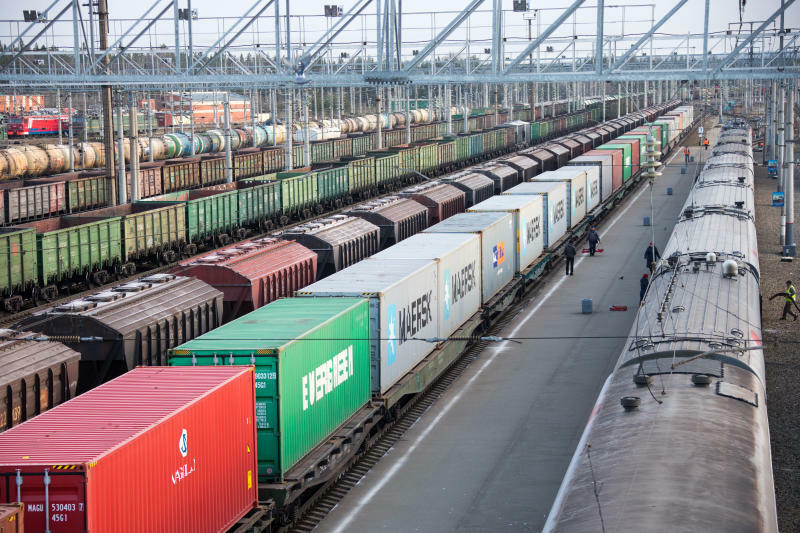 While transport by sea from Mumbai to St. Petersburg requires almost six weeks, it takes only three weeks via the ITC – as the first freight test run this October showed. Looking at the map, the shortest route to transport goods from India to Central Asia and Russia would be through Pakistan and Afghanistan, not bothering with the sea segment. However, difficulties in relations between India and Pakistan, and the complete uncertainty about the future of Afghanistan, make this route unviable in the short and even medium terms. Since Central Asia is a region rich in hydrocarbons, and an extensive prospective market for industrial products, the “longer path” is the only possible option for India. The 16 year-old project has not yet become fully operational. The first freight shipment was made along this route only this year, noted the Russian Transport Ministry representative, and it was rather a symbolic event. Once the corridor becomes operational, much like the large-scale Chinese Economic Belt initiative – the Silk Road, which also went through the same growing pains before transport volumes will begin to increase. Participants pointed to continuing difficulties in implementing the ITC project. The 150-km railway section in Iran, from Rasht to Astara, has not yet been completed. There are also purely logistical difficulties; because of differences in the range of goods proposed for shipment from north to south and back again, there will be a problem with the containers. Empty containers will accumulate at one end of the route while, at the other end, they will be in short supply. Also, the main problem most speakers noted were difficulties in customs clearances because, when moving from India to Russia, via Iran and Azerbaijan, the cargo has to cross state borders three times (and if the goods need to be shipped to Europe –that is a whole other issue). Until the summer of 2015, another significant obstacle to the implementation of the ITC was the situation with Iran, which was subject to international sanctions. The P-5+1 agreement reached on the Iranian nuclear programme in July 2015, and the subsequent gradual lifting of sanctions against that county, opened up new prospects for revitalization of the ITC project. It is no coincidence that, during the first ever trilateral Russian-Azerbaijani-Iranian Summit in Baku in August 2016, the N-S ITC was the main issue on agenda. The political importance of the North-South ITC project is not confined to logistical or economic factors. For Russia, this is particularly important, in terms of sanctions introduced by Western countries, and the need to import and search for new sources of imports of those goods which cannot be produced in Russia. The level of bilateral Russian-Indian trade (at its “peak” in 2013, it amounted to approximately $11 billion, dropping to $9.5 billion in 2014) does not correspond to the potential of these two countries, nor the high level of political engagement between Russia and India. The forthcoming accession of India and Pakistan as full members to the SCO opens up a whole series of new prospects for the expansion of integration processes in Eurasia. (The principal decision was taken at the SCO Summit in Tashkent in July 2016, and both countries should formally obtain this status in 2017). The ITC will play a crucial role in these processes. The SCO framework will help remove one of the main obstacles to the practical implementation of the transportation of goods, due to the complexity of customs procedures in each country. Russia, one of the four main participants in the N-S ITC, is also a founding member of the SCO. Now India will have full membership in this organization in 2017, while Iran and Azerbaijan have observer status. Iran has also been seeking full SCO membership for some time which, with removal of international sanctions, is quite possible now. India is also keen to establish a free trade zone with the Eurasian Economic Union. The increased participation of this large Asian country in continental integration will allow the successful resolution of the small technical and bureaucratic problems.